This time last year I had no idea where I’d be tonight. 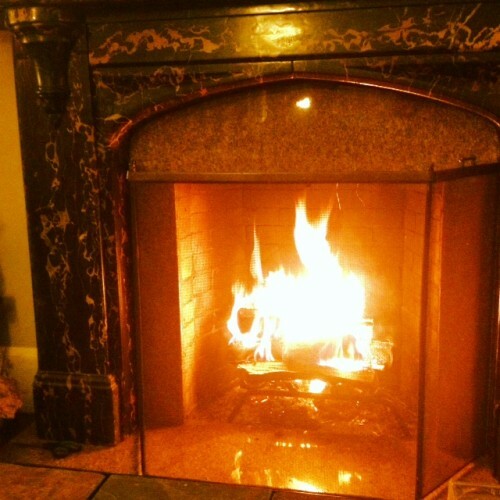 I certainly never expected to be sitting in front of the fireplace in my new Manhattan apartment. I like it here, despite the fact that at the moment it involves lots of cardboard boxes and piles of packing paper and I haven’t unpacked my books yet. But nice men came to take my too-big-for-the-elevator sofa apart and reassemble it in the apartment and you can’t even tell, and also the kitchen is mostly unpacked and the internet works, and also, fireplace, so it’s working its way slowly towards comfortable. I didn’t think I was a Manhattan kind of girl, but I knew I wanted to try a new city and this one ended up being the logical choice. I’m here frequently anyway, I know it fairly well though I suspect it will always remain a mystery. I am looking forward to exploring. Especially restaurants. It’s hard to believe 2012 is over. The world didn’t end, though as I remarked last year, ends feel an awful lot like beginnings, and this year was a lot of new beginnings for me. So I suppose it makes sense to say goodbye to 2012 in a new place, watching logs and paper and bits of dried evergreen burn merrily away. This year was about discovering classic cocktails and swimming in the ocean for the first time in years and finding out that the best potato chips in the world are in a hotel bar in Toronto. I felt tired for a great deal of this year. I still feel tired, but so far it looks like I’ll be able to rest a lot more in 2013. And hopefully write a lot more, too. No real resolutions, speaking of. Read more. Write more. Let myself be happy. Last New Year’s Eve I had a rather terrible evening. I hoped then that this year would be different, and while it is more different than I anticipated it is also even better. I didn’t have a distinct song of the year this year. This year was a lot of songs. A lot of jazz and a lot of Bon Iver and Florence + the Machine, Of Monsters and Men and Andrew Bird. This year was Dave Brubeck’s “Take Five”, for so many reasons. So I thought about what song feels like right now, and while I had a few possibilities I kept coming back to this one, which I fell in love with last year and danced to live in Toronto this year and seemed right, right now. New apartment. New city. New York. New Year. Hello, 2013. It’s nice to meet you. 13 is my favorite number, after all. Only three people per year get to consult the frog, so they have to hold a lottery. People used to try to line up outside his fence before the end of the year but once they started camping out earlier and earlier the city council decided to have a lottery instead. Everyone submits their name and the council choses three at random and on the last day of the year those lucky three people have their private session with the frog, one at a time in reverse alphabetical order. I used to get so excited about the choosing of the names, crossing all my crossables that maybe this year would be my chance for frog-bestowed wisdom. But you can only hold out hope with such small odds for so long, and eventually I only put my name in the lottery out of habit. This year my name was picked. A reporter came to ask how I felt (“surprised”) and someone else took my photograph and I had to sign non-disclosure forms promising never to reveal what wisdom the frog chose for me and me alone. 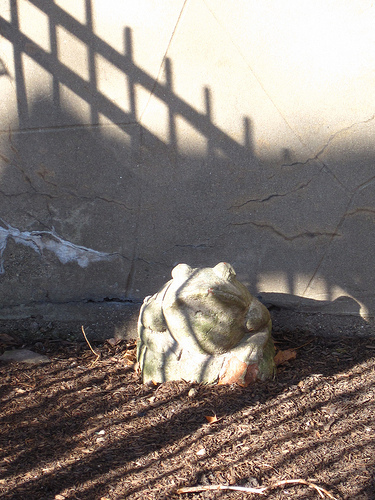 I was last, reverse-alphabetically, so I had to wait most of the afternoon, until the sun was preparing for the final sunset of the year, casting long shadows over the frog’s courtyard. The guards left me alone and the frog stared at me in silence for a very long time, frowning. Then he told me to stop waiting for permission to be happy. Erinland is moving. It is currently being dismantled and placed into cardboard boxes and it will hopefully reach its New and Exciting location before 2012 comes to a close and the New Year will be extra New in celebration. As a consequence of the relocation of Erinland, expect low levels of internet communication for the next few days along with periods of complete radio silence. Once the dust has settled, there shall be updates and possibly photos. 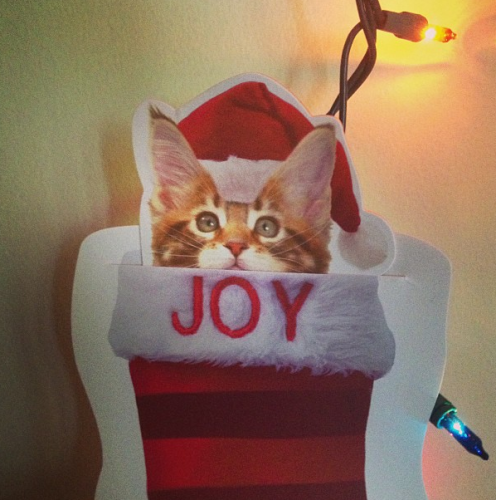 Happiest of Holiday Wishes. May your days (& nights) be both Merry & Bright. We hang the new worlds on the tree until we need them. 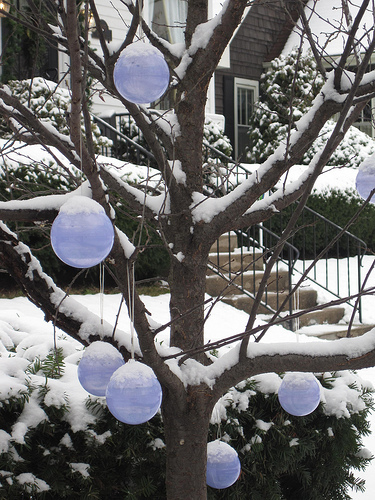 We could keep them in drawers or boxes but they look pretty hanging from the branches, especially when it snows. It’s nice to be able to look at them, too. They’re blue and swirly and round, though the roundness is an illusory construct since in reality they’re shapeless and infinite, but the tree is a construct, too. So is the snow, for that matter. We make more new worlds all the time, the old ones don’t last more than a few centuries without changing. They need to be refreshed. Sometimes the inhabitants fret and cry about the end of the world, but they never even notice when we give them a new one. We suspect it’s better that way. 2012 was a weird reading year for me. I feel like I didn’t read quite as much as I did last year. I read bits of things and more non-fiction than I usually do, there was more grazing than proper book devouring. I still got through a decent number of books. I didn’t, however, keep a proper list so I spent a lot of time staring at my shelves trying to remember if I read things this year or last year. For 2013 I will attempt to keep a proper list. This is in no way, shape or form a “best of” list. 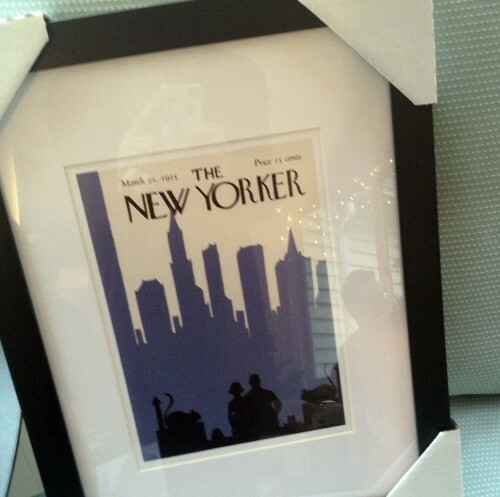 This is stuff I read in 2012 and liked a lot. Most of them were not published this year. There are two books in here that ended up with my name on them. There are a couple that had been on the to-read shelf for years. There’s a book that I read in its entirety in all of 15 minutes last week. There’s a cocktail book. And a whole lot of Kate Atkinson. Let’s start with the Kate Atkinson, shall we? My reading year was Atkinson-themed, I’d acquired Case Histories in Canada during my 2011 book tour and I took it on an airplane this year partially because it was a good size to fit in my bag and I got kind of obsessed after that and read all the Jackson Brodie books. I adore the way she writes, and I love a good mystery, and I love a multi-faceted narrative where everything feels disparate at first but then everything connects. They’re my new favorites to push on people, because sadly not nearly enough people in this country have read her books, but I hope that changes. The Tiny Book of Tiny Stories is filled with tiny bits of wonderment and delicious illustrations and it only took me 15 minutes (possibly less) to read but I know I will read it again and again. The Vanishing Act by Mette Jakobsen. First of the two with my name on them, I read this book before it was published in the US, curled up on a February afternoon with a pot of tea. I simply adore it, I’ve pontificated about it before, I recommend it to people whenever I can, book evangelist, etc. LOVE THIS BOOK. Love. Geek Love by Katherine Dunn. Had been sitting on the to-read shelf far too long, partially because I was avoiding circus books in general while working on The Night Circus. Finally read it and loved it this year, both a little bit sorry that I waited so long and a little bit glad because I think I read it at the right time for me. The Manual of Detection by Jedediah Berry. This was given to me by a lovely bookseller at Politics & Prose last year but I didn’t get around to reading it until this year, after several other people had recommended it to me, usually after hearing that I’m working on a fantastical detective-esque book-thing. It is a delightfully surreal detective story, and having spent a great deal of time reading a lot of classic, not-so-surreal detective stories lately I loved it all the more. State of Wonder by Ann Patchett. I meant to get to this last year but didn’t actually get a hold of it until it was out in paperback though I am pleased about that because the paperback is such a pretty color. This was one of those books I couldn’t put down and then couldn’t stop thinking about afterward, though it made me oddly melancholy. The Last Policeman by Ben H. Winters. As I mentioned, I have been reading a lot of detective stories. I also have apocalypse fatigue. I was primed to not like this book and I loved it. I especially loved the treatment of the impending end of the world, which felt nuanced and real and yet never overwhelmed the mystery, only informed it. The PDT Cocktail Book by Jim Meehan & Chris Gall. I think it is fair to say that I drank more cocktails this year than I read books, but I did also start collecting more cocktail books which should count for something. This is one of my favorites, because beyond having fantastic cocktail recipes it’s an interesting, gorgeously illustrated book. Why We Broke Up by Daniel Handler & Maira Kalman. The Basic Eight remains one of my all-time favorites, and this book reinforced my belief that Daniel Handler is or has been an adolescent girl, even though I’ve met him and he appears convincingly manly in person. This would be a brilliant, bittersweet story on its own but the Maira Kalman illustrations of the contents of the break-up box turn it into something extraordinary. Angelmaker by Nick Harkaway. Read as 2011 turned into 2012 and I said last year it’d likely make the 2012 favorites list and it did, of course. And it has the honor of being the very first book I ever blurbed, which makes it special. Also, it’s shiny. Also also, it truly did give me a raging crush on a fictional lawyer. Vermilion Sands by J.G. Ballard, lent to me and thus not in the pile. First Ballard I’ve ever read and some of the imagery will be in my head forever, I’m certain. Imagine: How Creativity Works by Jonah Lehrer, because I read it before everyone found out he was a lying liar who lies and I loved it then, and I still love a lot of the ideas behind it. The Resurrectionist by E.B. Hudspeth. I read a PDF galley and I cannot wait to see the finished book when it comes out next year. Beautiful and macabre, one of my very favorite combinations. The sign makes claims of FUN (twice, with exclamation points) but it’s far too stressful to be fun. The timer starts on a delay: a randomized silent countdown followed by a deafening buzzer. Once the game starts the lights flicker on and off so quickly that it’s difficult to stay focused on the target. The exclamation points keep multiplying and I do my best to ignore them. 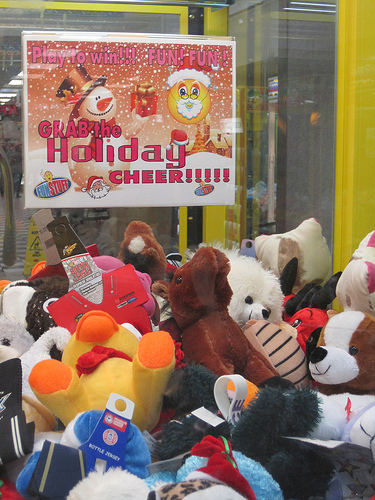 Something brightly colored with a Santa hat and fake beard keeps laughing maniacally when I miss. I don’t know what it is but I think it’s mocking me. Every round my migraine gets worse. It’s so tempting to just give up. But she really wants the pony. There’s no other way to get the pony. I will not say that I have too many books. I would never say that, even if I had All The Books which is probably impossible. Even if I had Most Of The Books, which I’m sure I don’t. But I have a lot of books. And I have a great many that I haven’t managed to read yet. I did a quick count just to get an estimate, I went around to most of my shelves and counted the books I hadn’t read yet. I stopped at 200, and that wasn’t all the shelves and I didn’t even look at the ever-growing pile of advance copies sitting in the office. I have been accumulating books at a much faster rate than I can read them. They even show up in the mail all unexpected-like. And of course I am almost always incapable of visiting a bookstore without buying a book or five. I think I’m at the point where 40-50% of the books I own I haven’t read yet. I used to keep them all on one shelf and had aspirations of keeping the to-read books contained to that single shelf but that never really worked and now they’re everywhere. They make me feel slightly less guilty this way, camouflaged in with books I have read. I’m not the fastest reader. I’m not the slowest, either, but it takes me a few days to read a decent-sized book, especially when I’m busy which is pretty much always lately. I’ve become slightly more fond of travelling just because it gives me more time to read. Since it would have been architecturally dangerous to pile all the to-read books into a proper to-read pile I instead put together a sampling of things that I am really looking forward to but haven’t gotten to read yet because of that pesky time thing. Hopefully all of these will be read in 2013, I should have more reading time next year. The leaves are patient. They wait, and they hope. Their less romantic compatriots tease them. Call them foolish for continuing to cling to their branches while the rest ride away on autumn winds. Sometimes they doubt, gazing up at blue skies, but they always hope. Eventually their patience is rewarded and the snow begins to fall. They blissfully catch as many flakes as they can hold. They know it will not last for long. Such things are not meant to last. 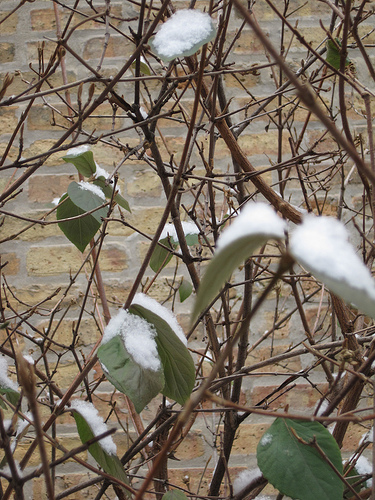 Leaves and snow relish their brief and chilly time together. I am quite frequently asked about books. Usually about books I like or that I’d recommend and I’ve been meaning to do book posts for the blog for ages, so December is going to have lots of them and this is the first one, featuring a tower of books. This is not an ideal bookshelf or an all time favorites or any sort of thoughtfully curated list. 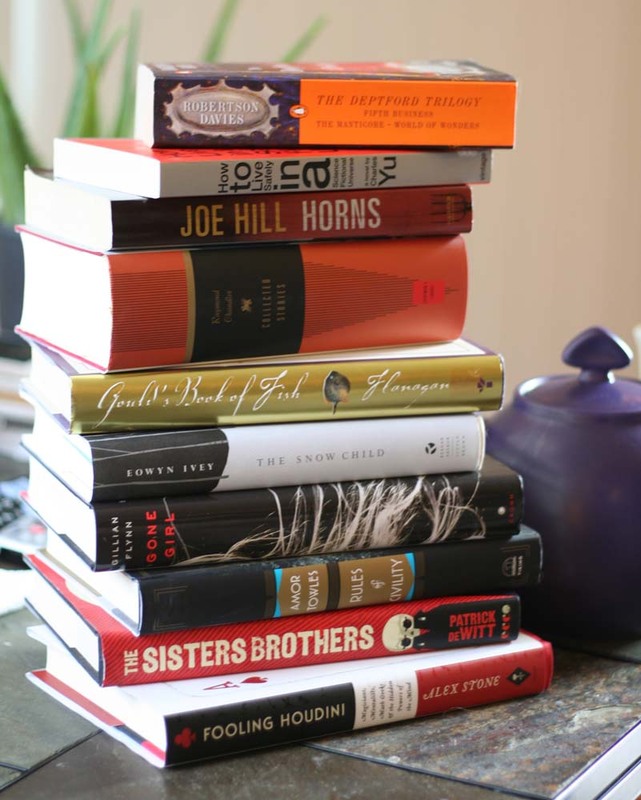 This is what happened when I wandered around my apartment searching my bookshelves for the books that seemed like they should be in this pile to be blog-shared. Caveats: there is nothing in this pile that I read in 2012, that post is separate and forthcoming (a preview: I fell in really deep booklove with Kate Atkinson this year). There are a lot of old favorites here, one of them is so old it has my signature inked inside the cover to distinguish it from when I first read it in high school, several have been read many times over. I purposefully did not choose multiple titles by single authors (though Smoke & Mirrors, Fingersmith & all the other Amphigoreys tried really hard to get in on the book tower action). Also, I’m not going to go on about why I love every book in this pile. 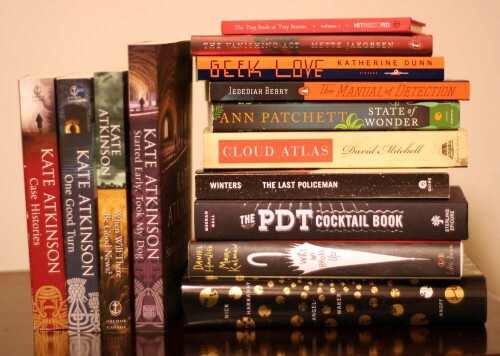 For one thing, this post would get far too long, and for another, booklove is a personal sort of thing and it doesn’t always fall easily into short sentences or even words. I hugged my copy of Einstein’s Dreams when I pulled it off the shelf, that’s probably all you need to know. 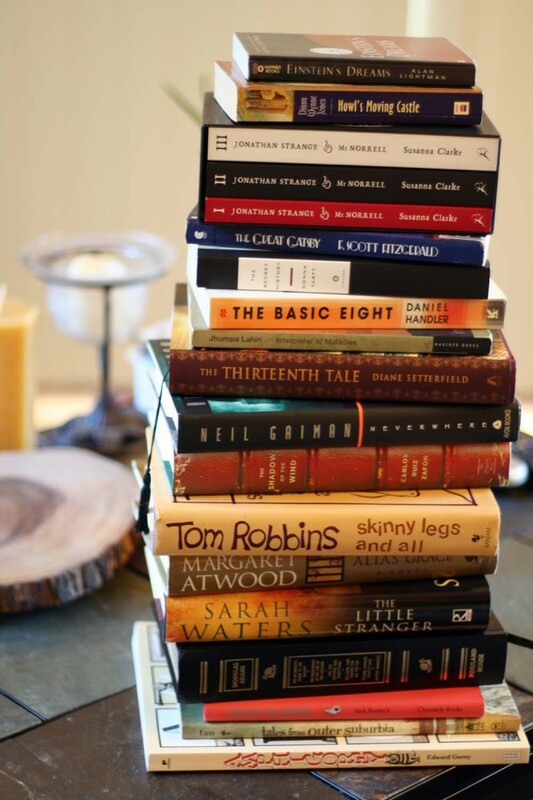 So here is Erin’s Tower of Books She Loves & Hopes You Might, Too. Presented in easiest-to-stack order and followed by a list of titles & authors.